An old type of battery may store far more energy and be less expensive than current lithium-ion EV batteries. Manufacturers of electric vehicles (EVs), and those interested in producing these green cars, are always hoping for improvements to be made to lithium-ion batteries, which power these vehicles, in order to extend the battery’s driving range and make it cheaper. However, Scientists from chemical company BASF are currently investigating an older type of battery that is showing promise where present lithium-ion batteries are not. 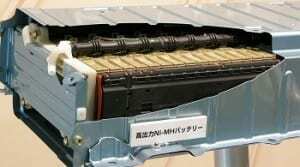 The basic type of battery currently used in hybrids could be the answer to less expensive and longer driving electric cars. BASF scientist have discovered that nickel-metal hydride (Ni-MH), an older kind of battery that is presently used in hybrids, may be improved by 10 times their current energy capacity, allowing them to store far more energy than the batteries currently used in EVs, reported MIT Technology Review. The scientists are exploring the capabilities of the nickel-metal hydride battery, and have recently managed to double its energy capacity, which has made them comparable to lithium-ion batteries. Their intention is to improve these older batteries even further by possibly increasing its energy storage by an extra eight times. In addition to being able to store more energy, the scientist are also aiming for these batteries to cost $146 per kWh (kilowatt hour), which is about half the cost of the cheapest lithium-ion EV battery. Nickel-metal hydride batteries offer electric vehicles more advantages aside from lower cost and more energy. Although nickel-metal hydride batteries cannot compete with lithium-ion batteries in terms of compactness and lightness, which is why they have been replaced by them in most portable electronic devices, when it comes to cars, such features are not as relevant. For instance, a nickel-metal hydride battery is more durable and safer than the lithium-ion variety. This is partly due to the fact that, unlike lithium-ion batteries, they do not use flammable liquids, which means they will not ignite if they are overcharged or overheat, making their electronic control and cooling systems more simple. Furthermore, based on data from the U.S. Advanced Battery Consortium, safety systems added to a lithium-ion battery pack can add as much 25% to the cost and raise the weight by 50%. That being said, there is still plenty of research that needs to be conducted before nickel-metal hydride batteries would be considered for electric vehicles. Researchers will need to test BASF’s cells to see if they can last for the length of time that conventional nickel-metal hydride batteries can. As for BASF, the next step is to change the materials currently used in these batteries with others that can withstand higher voltages and store more energy.